The 2018 Columbus Crew season does not resemble in the slightest any prior Crew season. Since last October, Crew fans have wrestled with the possible demise of something we dearly love. Due to these unfortunate circumstances, my family and I felt obligated to take an away game trip this season. My husband, Tim, said that we owed ourselves a long overdue trip. He was correct. The Memorial Day weekend game between the Crew and the Wizards was an ideal candidate. Fortuitously, the Sporting Kansas City (SKC) organization dubbed the game as “Retro Night.” The last time we visited Kansas City (KC), the Wizards were playing in a baseball stadium. Now that was retro! For this trek, we planned to wear Crew jerseys with our original badge. Retro night. Save that Crew. Our Crew. The three hard hats. During my time as a Columbus Crew supporter, I have experienced many life changes. Becoming a mother is one of my greatest life blessings. No words can truly describe my experience of sharing this team with my kids. Pure, unadulterated joy to witness my children burst into random Crew chants while at home. Our two-year-old daughter, Carigan, loves to run around the house chanting, “save the Crew.” Her brother, Markus, studies words to chants so he never misses a beat. The drive from our suburban house outside of Akron, Ohio to Crew Stadium has provided many photographable moments. With the uncertain nature surrounding the Crew, I wanted to share one away game with them. In my mind, I needed them to have this trip even if all the littlest one remembered were the stories and pictures from the weekend. To any parent reading this writing, I am happy to report my two kids did as well as can be expected on a twelve-hour drive. As a special edition to our trip my brother, Garyn, joined us on the trek. I knew his presence would be essential. The two of us have gone on away game trips together since we were teenagers. Away game trips have provided special times when we could travel even farther than usual to show love for our team. Some of our favorite Crew memories contain pieces of these trips. This trip would be different, not only because it was our first since the news broke in 2017, but because we knew we needed to do something Save The Crew (STC) related. 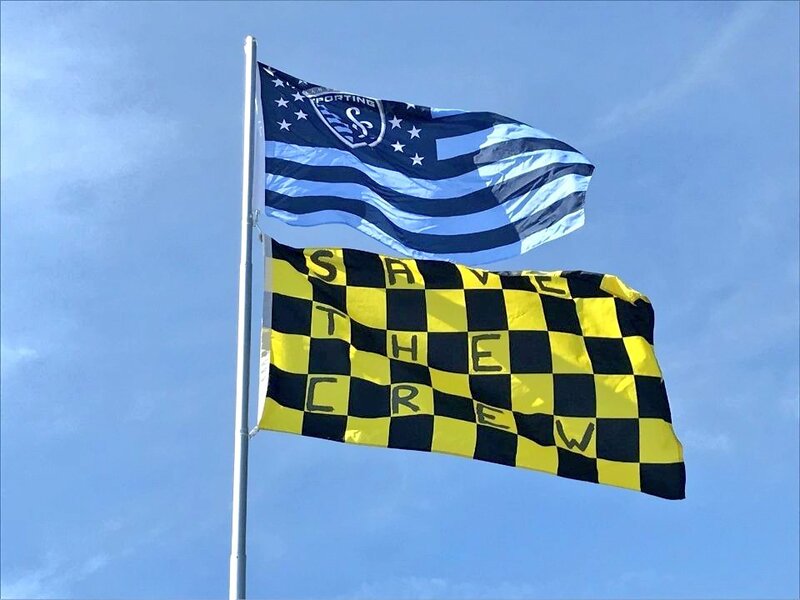 We reached out to the Kansas City Cauldron to see what could be coordinated between Crew fans and KC fans. Since the Cauldron supports the #SaveTheCrew cause, STC displays were performed. I am indebted to the Cauldron for playing a part in making the KC trip one to remember. On away game trips, camaraderie exists between fans who usually sit and fans who usually stand both choose to stand and chant for the team. You hear comments such as, “I do not know how you supporters chant for ninety minutes.” Bonds are forged during those moments. Away game sections remind me of the Crew supporters’ section during the mid-2000s. Back then, if one person left the section for a beer or the bathroom, the section was significantly hurt. Nowadays I can walk Carigan around the stadium and still hear the Nordecke. If you have never experienced an away game trip, then I hope you still get a chance. Our 2008 away trip to KC resulted in a 3-nil win for the Crew. We were not so lucky this time. We saw a missed penalty. Soon after, a red card was issued. Fortunately, our defense held strong, and the Crew managed to salvage a point on the road while being down a man. In addition, we witnessed the sight of seeing an opposing supporters’ group showing outward support for the #SaveTheCrew cause. These displays are a droplet in the bucket of work the STC movement has accomplished. As the old saying goes: Drops in a bucket can eventually fill up a bucket regardless of the bucket’s size. At any rate, I was honored to stand with the ragtag group of Crew fans at Children’s Mercy Park. Our group consisted of Crew fans who flew to KC, who drove to KC, or who were now Kansas or Missouri residents. We had a drum, banners, passion, and our voices. Some KC fans complained we were too loud. Those complaints let us know that we did our job. We had come to the stadium to support our team. I am thankful to my fellow fans who came to support our Crew. I knew this trip would be like taking a seat on an emotional rollercoaster. The mixture of excitement, anxiety, sadness, and pride bubbled over through the course of the weekend. My excitement to share my passion and enjoyment with my family. My anxiety to carry out STC plans and interact with SKC supporters. I am not a social person so the thought of coordinating anything Crew related seemed daunting. My sadness over what has happened in the last eight months. My pride in wearing black and gold to an opposing stadium. Writing this piece was not an easy task. Crew fandom is a semi-private space for me. However, I implore other fans to leave your comfort zones. Show support in numbers. Continue to take action. Continue to share your stories. Be prepared to continue this fight. Continue to represent this community because our community is an important piece in the United States soccer community. Continue to call bull on misinformation. Repeat after me: We are United States soccer’s past, present, and future. So I have two main takeaways based on my interactions with KC fans from this trip. 1) Major League Soccer (MLS) supporters care. They care that an original MLS team is close to being carelessly and unceremoniously ripped from its fan community. 2) Casual fans are aware of the situation. People are watching. They know the difference between the right action and the wrong action. While we were heckled by a few KC fans, we received support from many more KC fans. Throughout the day, we heard sentiment such as “we are in this league together,” “we want to save the Crew,” and “the league should be ashamed if it does not step in and do something right.” This team holds layers upon layers of meaning for much more than a small group of fans. In the end, I hope my children will continue to grow with this team. I hope they develop their own Crew stories, friends, and game-day rituals. That they will be part of the larger Crew community for many years to come. One last away game trip? No, I am not ready to say goodbye. I am beginning to plan another one. So crazy, we did the same thing with our family. We made a list of ‘must do’s’ if this is going to be the last season for the Crew and one of them was attending an away game. My sister in law lives in Kansas City so it was a natural. We had Columbus and Kansas City fans in our group, but they were all Save the Crew.